Anyone who runs competitively will tell you that the right shoes can make a tremendous difference in everything from your speed to your endurance. Regardless of whether you are training for an upcoming race or are just running for fun, choosing the right pair of shoes is essential. Shoes that don’t fit correctly or that are improperly designed not only make it more difficult to run but they also increase the likelihood of injuries occurring. When your feet are not properly supported, muscular strain increases, leaving you feeling even more sore than usual. One of the biggest mistakes that people make with their running shoes is failing to replace them often enough. Most experts recommend replacing your shoes after running about 500 miles in them. 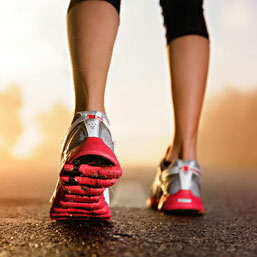 If you run regularly, that means that you may need to buy new shoes every few months. Think about how far you run each day and how old your shoes are to decide whether or not you need a new pair. The way that your foot strikes the ground plays a key role in determining which shoes are best. To get a better understanding of your feet, there is a simple test that you can perform. This test is designed to identify the height of your arch. To begin with, place a brown paper bag on the ground. Make sure that it is large enough for you to stand on without your feet hanging off the edges. Next, get your feet wet and step onto the paper. After a moment, step off again and evaluate the footprints that you left behind. If you have normal arches, you should see a curve that connects the heel area with the toes. The width of this curve should be approximately half of the entire width of your foot. If the curve is narrower or if it is broken, it usually indicates that you have high arches. On the other hand, if the line is relatively straight and it doesn’t really vary in width, you probably have low arches. When you run, the shape of your foot causes it to move in a very specific way. When your foot strikes the ground, it rolls in one direction or the other, based on whether you have high arches, normal arches, or flat feet. This rolling motion is known as pronation. When shopping for shoes, it is important to choose shoes that are designed to properly support your feet, based on the height of your arch. Proper support will help ensure that you don’t over- or under-pronate. If you have high arches, you most likely under-pronate. This means that the majority of your weight lands on the outer portion of your foot, simply because the inside of your foot lacks support. If you have low arches or flat feet, on the other hand, you most likely over-pronate. That means that your feet have a tendency to roll to the inside. People with regular arches generally don’t have problems with over- or under-pronation. When shopping for running shoes, it is extremely important to try them on. You need to feel how they fit before you can decide whether or not they are right for your feet. If you are shopping at a shoe store, check to see if they have a treadmill on hand that you can use to test out the shoes. If not, walk around the outer perimeter of the store or jump around in place to make sure that the shoes fit correctly and feel good on your feet. If you are going to be participating in races, you should purchase shoes that are specifically designed for racing. These shoes tend to be a lot lighter weight than traditional running shoes. For training, however, you should use regular running shoes since they provide extra support. If you wear your racing shoes every time you train, you are more likely to experience injuries since they don’t offer as much support. #1. Avoid being in a hurry when you are shopping for shoes. Choosing the wrong shoes can cause serious injuries like stress fractures. It is best to take your time to avoid making the wrong decision. #2. Shop at stores that specialize in running shoes. Anyone who assists you should be knowledgeable about running shoes or should be a runner themselves. #3. Shop in the afternoon or evening. Feet tend to swell throughout the day. Shopping later in the day helps ensure that your shoes won’t become too tight because of this swelling. #4. Bring your previous pair of running shoes with you to the store. That way, the staff can evaluate the tread to determine how your feet move when you run. #5. Dress for shoe shopping. Consider wearing athletic clothing since many shoe stores now have treadmills on hand that you can use to test out the shoes. #6. Wear the same socks that you plan on running in. If you use shoe inserts, you should also bring them with you. #7. Avoid buying shoes that feel uncomfortable when you try them on. If they don’t feel good in the store, they won’t feel good when you are running in them, either. #8. Don’t get too hung up on buying a particular style or on purchasing a specific brand. Explore all of your options to see which shoes are the most comfortable and supportive. #9. Even if a friend recommended a specific pair of running shoes, you should shop for shoes based on your needs. Their running style may not be the same as your own. #10. Don’t skimp. A high-quality pair of shoes can make a real difference in your comfort and can protect you from injury. If you have an injury then there are all sorts of shoes to help – check out these shoes for Plantar Fasciitis for example. It is definitely an investment that is worth making. The minute you slide a running shoe on your foot, it should feel good. You should have plenty of room in the front of the shoe. Try wiggling your toes to make sure that you can move them. There should be enough room between the end of your toe and the front of your shoe. If the front of the shoe is relatively pointed, make sure that it doesn’t cause friction against your other toes. Choose shoes that are wide enough for your foot. Generally, women have feet that are shaped slightly differently than men. The back of each foot is usually narrower than the front. Shoes that are designed for women typically take this into consideration. You may need to try on several different styles or brands before you find one that fits right. The heel of the shoe should fit well enough that your foot doesn’t move up or down when you walk. At the same time, however, it should be loose enough that it doesn’t pinch or bind your foot. If there is a tab at the top of the heel cup, check to make sure that it doesn’t cause any pain. Try walking or jogging in the shoes in the store to test them out.